Through this valley passed the Oregon Trail, highway for early explorers, fur traders, California-bound gold seekers, freighters, and brave pioneers seeking new homes in the West. Traffic was especially heavy from 1843 to 1866. At times as many as 800 wagons passed this point daily, heading both directions. The Pony Express passed through the valley, followed by the first telegraph lines. This was also the military road to western destinations. Beginning in 1847, the Mormons broke a new trail on the north side of the Platte. Indian raids by the Sioux and Cheyenne were severe in the 1860's, and several attacks occurred near here. During the Plum Creek Massacre a few miles west, wagons were burned and several people killed or captured. Huge herds of buffalo once roamed these prairies, often stopping traffic on the trail. In the 1870's hunters slaughtered them by the thousands. 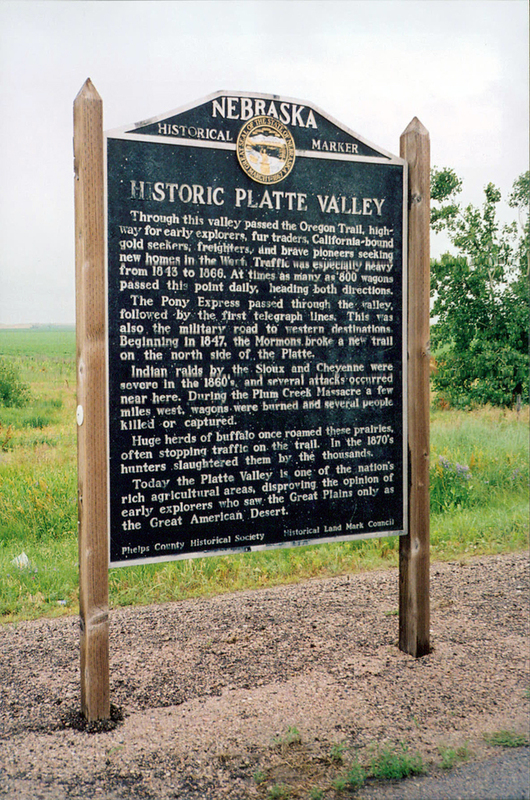 Today the Platte Valley is one of the nation's rich agricultural areas, disproving the opinion of early explorers who saw the Great Plains only as the Great American Desert. “Historic Platte Valley,” Explore Nebraska History, accessed April 19, 2019, https://mynehistory.com/items/show/398.